Amrita SeRVe recognises the importance of sourcing raw materials locally and to that end, explores options to preserve traditional building methods while meeting modern requirements, such as durability and cleanliness. Electrical demand is met either through the national grid or, wherever necessary, from renewable energy sources independent of the government supply. Alternative fuels and more efficient heating methods for cooking are explored. This comes along with great emphasis on the importance of reforestation, which not only compensates for the historic depletion of forests, but also improves groundwater levels, balances the local climate and increases soil fertility. Eco-friendly infrastructure is a vision that requires everyone to think of the whole, caring for our environment, the community and all of society—today, tomorrow and for generations to come. Amrita SeRVe is committed to preserving and developing traditional building methods. Every village community has special techniques using locally available natural materials. With the rise of ferrocement construction, these methods have been neglected and there are only very few knowledge-bearers alive from the olden days. There are countless techniques—ranging from clay tiles or thatched roofs, to wood carving and mud buildings—that have endured decades with little or no maintenance. The greatest advantage of natural building materials over cement is the thermal properties of the houses. Regardless of whether it is burning hot or freezing cold, traditional buildings have a strong tendency to maintain a comfortable climate inside. On top of that, all-natural materials feel warm, are nontoxic, and decay without harm if abandoned. Amrita Vishwa Vidyapeetham is presently conducting research on the methods of tribal craftsmanship. It is also exploring ways to blend contemporary practices with the traditional techniques—paving the path for innovation, especially in the area of weather resistance. As such, a team has begun exploring the widely known modern construction material, Compressed Stabilized Earth Blocks (CSEBs), by constructing a model house on Amrita’s Coimbatore campus. Because Amrita Vishwa Vidyapeetham’s activities are closely coupled with in-depth research in the tribal villages, we can expect a vast number of advancements in this area over the coming years. Amrita Kuteeram is a project of the M.A. Math that comprises the construction of homes for the poor. Since the beginning in 1998, more than 45,000 free homes have been constructed for the poorest people across the country. 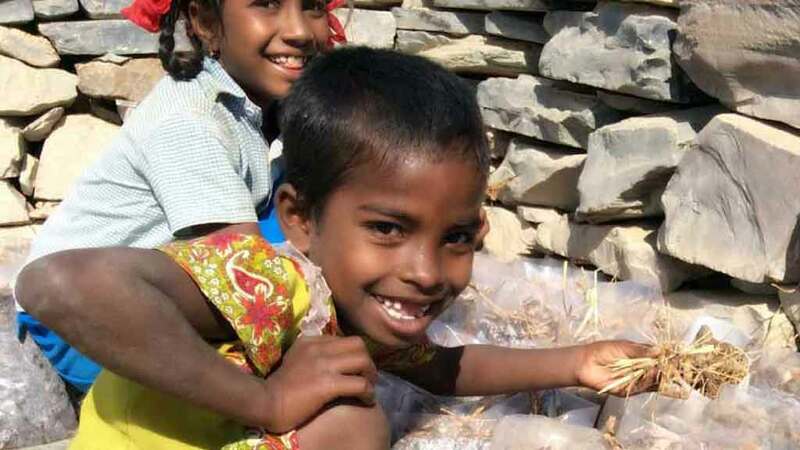 When Amrita SeRVe started the work in the villages, there were some families who did not have a proper home or the means to build one for themselves. For these families, 39 houses were constructed across eight states. During the last two centuries the amount of deforestation surrounding the villages has been so severe, that today only a handful of isolated trees can be found in the midst of dusty fields or plain grasslands. This has a serious impact on agriculture and groundwater levels. Forests maintain soil fertility and cool local temperatures, as well as allowing rainwater to sink into the ground. With their strong roots and branches, they provide protection from landslides, flooding and strong winds. Relentless forest clearing has resulted in forest boundaries receding from civilisation; now the people are suffering the consequences of being exposed to drought and extreme weather. Amrita SeRVe is supporting tree planting through sapling subsidisation and seed-ball preparations. 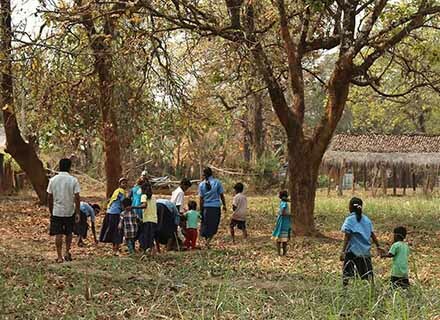 Since planting a tree is a lifelong investment, a lot of emphasis is put on the environmental education of school children. For example, on World Environment Day (5th of June), the children were taught how to prepare seed-balls from soil, cow dung and fertilising herbs. One or several seeds can be enclosed by this mixture, dried in the sun and then thrown into available space right before the onset of monsoon rains. This ensures effortless sprouting and growth of the plants. The most important end-use of electricity is to light homes and streets. Houses in the villages often have very small windows, because most of them don’t have shutters, allowing only tiny amounts of natural light to enter. Especially at night, the rooms are immersed in darkness. Not only does lack of lighting pose a challenge for women when they are cooking, also it seriously limits the ability of school children to do their homework. Absence of light, always carries with it a feeling of vulnerability and can make walks along unlit roads an uncomfortable, and even dangerous experience. consisting of one small panel, a battery unit and three lights. Amrita Vishwa Vidyapeetham’s Center for Wireless Networks and Applications (WNA) and Amrita SeRVe have fitted such systems to homes in Chhattisgarh and Kerala. In some of these locations, they have also installed solar streetlights while training locals in their maintenance. Also, some larger projects were implemented in Kerala wherein a solar micro-grid was installed in Wayanad District and a hydroelectric power plant commissioned in Idukki District. Both plants function entirely self-sufficiently, providing a steady supply of electricity to all the households in each community. These systems were pioneered by students and faculty of WNA. The work in the villages was facilitated through the Live-in-Labs® programme and Amrita SeRVe.